The only thing more surprising than Mr. Strzok acting like a teenager is the people who enabled him. Mr. Comey or Mr. McCabe should have reminded him that the degree of bias exhibited by him would make it difficult if not impossible for a jury trial to convict anyone. When we hold Mr. Strzok’s actions to this higher standard, we can see that his actions crossed the line from stupid to criminal. If it takes an Inspector General’s report to remind everyone that FBI policies were deliberately ignored, we can safely assume that there were no adults in the room when the senior management of the FBI met. The most serious threat to the country in 2016 was Mr. Strzok’s abuse of prosecutorial power. This was a knife to the heart of our judicial system. Mr. Strzok’s investigation did not find any Russian collusion but it surely destroyed the integrity and reputation of the FBI. The Russians are giddy. They did not have to pay Mr. Strzok a penny for him to do their bidding. What are we to do if those chasing the devils decide to chase after us! Like many other IT guys and gals, I was never sold on the original explanation of the DNC hack. There were so many loose ends. Why did the Russians hack the DNC servers? All of the embarrassing Clinton emails came from the Podesta emails that were acquired prior to the DNC Hack. It was the Podesta emails the Russians were using to taunt Trump and Clinton surrogates in London in May 2016. Yet most people think Ms. Wasserman Schultz was fired because of the DNC Hack. The DNC had plenty of reasons to fire Ms. Wasserman Schultz. The two biggest reasons were the way the DNC treated the Sanders campaign and the proportion of donations collected by the DNC given to the Clinton campaign. Obviously, the bad relations between the DNC and the Sanders campaign had nothing to do with the Russians. If the Russians hacked the servers, why disclose the hack via Wikileaks so quickly? It was so out of character! It is almost as if the Russians hacked the DNC servers as a favor to the DNC. If the DNC proceeds with the lawsuit there are two things I would like to find out. 1. Was Either Crowdstrike Or Fusion GPS One Of The Private Contractors Who Ran Unsupervised FISA-702 Queries In Early 2016? By April 18, 2016, the FBI they knew that their FISA-702 “Queries” irregularities had triggered a full Compliance Audit by the NSA. This would lead NSA to admit a non-compliance issue to the FISA court on October 26, 2016. Most of the FISA-702 “Queries” irregularities occurred before April 2016. This was a really big FISA abuse that happened just days before the DNC Hack. I think the FBI and the private contractor took the risk because they did not think they would get caught. This would explain the arrogance that was displayed later in 2016 when the FISA court would be further abused with the Trump dossier. Considering the abuse the FISA court has taken, I wonder if they would be willing to disclose the name of the contractor if that contractor was found to be collecting information that could be used against political opponents. Did the private contractor have a relationship with the Democratic party? Was this unsupervised access to raw FISA data used to spy on political opponents? Was this unsupervised access to raw FISA data used to spy on the Sanders campaign or the DNC? Were they looking for previously unknown classified or top secret Clinton emails from her server that were not part of the emails she turned over? 2. What Was Crowdstrike Doing In May 2016? This is a question that near and dear to old IT guys. In my world, if our systems are hacked on April 29th them my job is to have them fixed by April 30th. The idea that Crowdstrike did not fix the problem until June 10th is shocking. Obviously, this was a lousy plan. Why let your systems be hacked for over 30 days? What did they learn that was so important? I guess that Carter Page’s identity as an undercover FBI employee is the classified information that the Democrats are trying to hide from the #FisaMemo. Too bad that the NY Times revealed his secret identity in April of 2017. Can we find out how many times the Trump dossier was used for a FISA warrant? At about the same time the FISA warrant was authorized to surveil Carter Page, someone in the FBI or DOJ leaked information about a FISA warrant in connection with the investigation of Russian bank activity between the server in Trump Tower. Since the FBI reopened the investigation into Hillary Clinton’s emails just 11 days before the 2016 election, this leak looks like an “insurance policy” to protect the FBI’s reputation by making sure that Mr. Trump did not win the election. I read the FISA memo and did not see where it impacted national security or attacked the Department of Justice and the FBI as institutions. Mr. Comey needs to look no farther than himself to find someone who leaked and destroyed trust with intelligence agencies. A broader condemnation can be made of the intelligence agencies for the numerous leaks made in October, November, and December of 2016. This is a period Mr. Comey was in charge of the FBI. Due to the information that was leaked, people in the DOJ and FBI involved with the investigation are the likely leakers. Although these leaks are serious issues, the abuses described in the memo are specific to certain individuals in the DOJ and FBI who intentionally misled the FISA court in October of 2016. History reminds us that this is not the first time prosecutors have abused their postion for what they perceive is the common good. Here is a quote from a book published in 2000, The Tyranny of Good Intentions. When a prosecutor is intent on a frame-up or the Justice Department on a cover-up, not even money and exposure can stop the process. In high-profile cases, clever prosecutors protect themselves by first convicting their victims in the media. With the public aroused against the victim, the prosecutor has a free hand. I hope that releasing the memo will help the FBI and Department of Justice become the organizations that as Trey Gowdy said, “do not give a whit about politics“. To achieve that goal they have to stop doing boneheaded things. Borrowing from a Forbes article, 5 Boneheaded Ways Smart People Fail, here are some examples that might help them achieve that goal. 1. Several People In The FBI Thought They Were The Smartest Person In The Room. Your chance of failure is heightened when you don’t care to know what other people think. 2. The FBI Management Surrounded Themselves With Yes-men and Yes-women. It is hard for me to imagine how Fusion GPS and the Trump dossier could have been so influential within the Department of Justice without Yes-men and Yes-women. 3. Several People In The FBI Viewed Themselves As Untouchable. These unrealistic expectations made failure inevitable. Leaders must continually question their positions, especially when they’re on top. 4. Several People In The FBI couldn’t tell where they stopped and the FBI began. The best example of this Mr. Strzok comments about an “insurance plan”. Just do your job! 5. Several People In The FBI drove past red flags and warning signs. Some leaders are so enamored with their personal visions that they’re willing to drive the company off of a cliff in pursuit of them. Many of these leaders solicit input and suggestions, but they just can’t take their feet off the gas. Persistence is a great quality in a leader but not if it means ignoring the facts. The #FISA Collusion scandal reminds me of the tactics of J. Edgar Hoover. Wikipedia describes him this way. He was found to have exceeded the jurisdiction of the FBI, and to have used the FBI to harass political dissenters and activists, to amass secret files on political leaders, and to collect evidence using illegal methods. Hoover consequently amassed a great deal of power and was in a position to intimidate and threaten sitting presidents. Wow, doesn’t that sound familiar! Sara Carter says a classified report alleges extensive ‘FISA Abuse’ related to the controversial dossier. We already know from the Top Secret FISA Court Order that someone in the FBI allowed a private contractor run unsupervised “FISA-702 Queries”. These are tactics J. Edgar Hoover would approve of. Maybe we can save FISA by firing some people. A good first step is to #ReleaseTheMemo. Why Would Someone In The FBI Allow A Private Contractor Run Unsupervised FISA-702 Queries? Someone in the FBI delegated the investigation of a “National Security” issue to a private contractor running unsupervised “FISA-702 Queries”. What does that say about the FBI management? It is obvious from the Top Secret FISA Court Order document obtained by Judicial Watch on May 23, 2017, that the FISA Court was livid at the FBI, Department of Justice, and the NSA. They broke the rules and the judges were pissed. This is a really, big deal both legally and politically. This is the type of flagrant abuse Senator Rand Paul could use to force a debate on the Patriot Act. All of the good intelligence operations working under the auspices of the Patriot Act are threatened. So why did the FBI take the risk? If FISA-702 “Queries” do not need approvals from FISC so long as inquiries center around “National Security”, why was it being handled by a private contractor and not FBI personnel? Lawrence Person at the BattleSwarm blog makes the argument Fusion-GPS was the private contractor. It kind of makes sense, if the contractor was charged with investigating Russian interference in the United States political process. Since they wrote the infamous Trump dossier we can safely conclude that they are familiar with the shadier side of politics. I suspect the FBI chose a private contractor so that they could compartmentalize the information and avoid allegations the FBI was being used to spy on political opponents. I have two problems with this strategy. Political interference is an important issue but it is not a “National Security” issue. If political interference was not a “National Security” issue then the unsupervised FISA-702 “Queries” were illegal. I think that was the main point the Top Secret FISA Court Order was trying to make. Allowing a private contractor with a background like Fusion-GPS run unsupervised FISA-702 queries is a really bad choice. It looks like a fox in charge of the hen house scenario. When I read the Top Secret FISA Court Order complain that “they had access to raw FISA information that went well beyond what was necessary”, I have to assume that the contractor did something illegal or unethical. It is hard to tell whether the Court is madder at the FBI or the private contractor. Why did the FBI take the risk? The FISA court believes that these FISA-702 “Queries” should have been supervised and probably submitted to the FISA court. The FBI probably saw the protection of the Democratic party from Russian meddling as their patriotic duty and considered the legality of their actions a minor issue. More importantly, I think the FBI took the risk because they did not think they would get caught. Even if they were caught, they believed because of their good intentions that “no reasonable prosecutor would bring a case”. The last thing they thought was that this investigation would blow up in their faces. By April 18, 2016, the FBI they knew that their FISA-702 “Queries” irregularities had triggered a full Compliance Audit by the NSA. This would lead NSA to admit a non-compliance issue to the FISA court on October 26, 2016. The Top Secret FISA Court Order leaves no doubt that the non-compliance issue was threatening the reauthorization of the Patriot Act. The “good intentions” of the FBI had transformed a minor “National Security” issue into a major one. The only question left is with everyone’s career at the FBI on the line, would the FBI attempt a cover-up? Coincidentally I am reading a book called “The Tyranny of Good Intentions” and it reminds us that prosecutors and bureaucrats have been trampling the Constitution in the name of justice for a very long time. In that book, they quote Joel Prentiss Bishop, an American lawyer and legal treatise writer who said, “In times of excitement when vengeance takes the place of justice, every guard against the innocent is cast down.” Mr. Comey, Mr. Strzok, and the others seem to embody this particular interpretation of the law in which “vengeance” justifies their extra-legal actions. Once they crossed the line into extra-legal actions, there was no turning back. The Trump dossier can be seen as a natural byproduct of the original crime. In for a penny, in for a pound. As a person who has been selected for three juries, I am puzzled at the staffing decisions by Mr. Mueller. As a juror, I do not want my time wasted by a prosecution’s case tainted with apparent bias. Bias is a pretty good reason for a juror to say no to the “beyond a reasonable doubt question”. If Mr. Mueller is pursuing the same blind justice that does give a whit about politics, Mr. Mueller’s staff must be beyond reproach. This is not rocket science. Why did Mr. McCabe, Ms. Rhee, Mr. Ohr, Ms. Page, and Mr. Strzok not recuse themselves from this case? Although Glenn Kessler makes a good argument that Mr. Mueller “is legally barred from discriminating career appointees based on political affiliation”, there is nothing prohibiting the aforementioned people from recusing themselves because of apparent bias. This would have been the right thing for them to do. Since Mr. Mueller replaced them without much effort we have to assume that qualified lawyers exist without the political baggage. Why not start off with them? Are there any adults at the Department of Justice? Is this the same culture of corruption problem we have seen at the Department of Justice for the last eight years? If the Department of Justice cannot police themselves should we allow Section 702 of the Patriot Act to be renewed without substantial reform? In the past, I was willing to believe the Department of Justice would do the right thing and not abuse the special privileges granted in the Patriot Act. My position on the Patriot Act has evolved. Last year I wondered whether the Fusion GPS Dossier Weaponize The FBI? I now believe that the primary motive for FISA warrant in October of 2016 was to discredit the Trump Campaign. The FISA warrant was not about catching spies or terrorists. It was about using the power of the government to punish a political opponent. If the folks at the Department of Justice cannot play nicely with these powers, we need some adults in the room to keep the kids out of trouble. Now is a good time to listen to Amash, Paul, and Others Trying to Stop Congress from Expanding Domestic Surveillance Powers. Did The Fusion GPS Dossier Weaponize The FBI? I am still trying to get my head around the possible impact of the dossier in getting FISA warrants. It looks like dossier weaponized the FBI for political purposes. Almost immediately after a FISA warrant was attained to wiretap the Trump Tower in October of 2016, it was disclosed to Louise Mensch. The FBI had a history of integrity but the timing of this leak was so out of character. Now their integrity looks in peril. As I argued in the post, The #Obamagate Motive, it looks the primary objective of the FISA warrant was to discredit the Trump Campaign. In hindsight, it made the FISA court judges like a bunch of fools. This is not going to end well for the FBI! Can Anyone Make The FBI Look Professional Again? 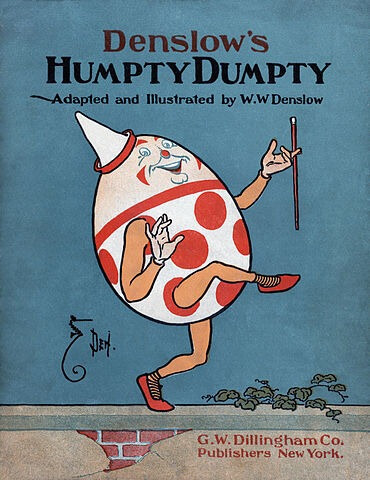 If the dossier played any role in the FISA warrants, I am not sure all the kings men can put Humpty Dumpty back together again. Director Comey and the FBI shredded the integrity of the FBI and for what? How does anyone including the FISA judges trust the FBI again? The fact that the dossier was funded by the Democratic party shows how far the FBI reputation has fallen. The FBI should have known who funded the dossier. Investigating is something the FBI is supposed to be good at. I would think that the last thing the FBI wanted on their resume was that they acquired any FISA warrant based on Democratic Party funded opposition research. If the dossier is all the FBI had, It makes the case that President Trump did the right thing in firing Director Comey. The fact that the dossier was circulated in the government is an embarrassment to the FBI and a source of amusement for the Kremlin. I am sorry but I am not sure anyone can make the FBI look professional again.